The original plan was to circumnavigate Cypress Island, launching from Washington Park just outside of Anacortes, and spending the night at either Cypress Head, Pelican Beach or Strawberry Island. Two of our friends, Kevin and Taffy, were renting kayaks from Eddyline, however, and after meeting them there and talking to the shop manager, we decided to launch from the Cap Sante marina instead, and circumnavigate Guemes Island, spending the night at Pelican Beach if it didn't look too crowded (hah!) or Cypress Head. It took less time to get the boats than we had planned, since Kevin and Taffy didn't need to attach their boats to their truck, so we had time for lunch before we launched. There's a great little Texas-Louisiana BBQ place just next to Eddyline now - if they've got it, I'd recommend the 'gator gumbo - good stuff! The currents were going to be in our favor starting around 2:00, so by 1:00 we were unloading boats, and loading gear into the kayaks. It'd been a while since any of us had been out in our boats, so we were just ready to go at 2:30. We headed out around the point at Cap Sante, staying close to the shoreline and admiring some of the houses and gardens perched along there. When we got to the NE corner of the head we pulled up together to decide if we wanted to cross directly to the SE corner of Guemes Island here, or paddle west to the narrowest point of the channel, which also happens to be a ferry crossing. Boat traffic looked light, and we were all fresh, so we headed for the point on Guemes Island, trying to stay together as a group so other marine traffic would have an easier time spotting us. The crossing was made with no difficulties - however there was a large barge at anchor halfway across the channel. We knew it was at anchor, but as we neared it, there was a definite impression of it moving, with even a bow wake appearing (from the current, no doubt). We quickly changed course to cross behind the barge, and laughed a bit at ourselves as we got close enough to realize that our first impression had been correct - the barge was anchored, and the "movement' was all an optical illusion! We turned the corner of Guemes Island and paddled the channel between Guemes and Huckleberry Islands, pointing out where good campsites were on Saddlebag Island, just east of Huckleberry - we'd spent a summer solstice night there in 1993. 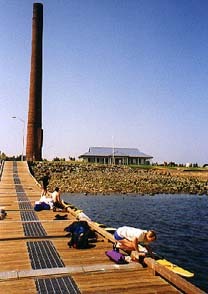 The northern coast of Guemes starts out undeveloped, and cliffy. It was pleasant paddling along there, with a following current, no wind, and warm sunshine. We studied the charts and played "name that island", trying to guess if certain points were in fact islands, or just peninsulas of larger islands. Eventually the cliffs of Guemes Island start dropping back towards sea level, and here is where the homes and beach communities started appearing. We passed some folks water skiing, and some hauling in crab traps - the bottom here is sandy with plenty of sea weed, making a fine spot for catching crustaceans. A short distance before the end of the northern shore there's a small resort - I wouldn't have known it from the water, but Kevin had stopped here before, and knew where to beach the boats. We'd been paddling for a couple of hours now, so it was nice to get out and stretch our legs. There was also a small store there where we bought ice creams and sodas. We relaxed watching some young boys cast their fishing lines from the beach and pull in small rock cod - they were having a blast (I'm not sure if the fish were), and it rarely took longer than a minute or two for them to have something on their line. We still weren't sure where we would be spending the night, and it was getting later, so we pushed off once again, and headed for the northern tip of Guemes Island. From here, there's a small chain of islands, the Cone Islands, that give you something to paddle through on your way across Bellingham Channel to Cypress Island. The crossing to the first of the islands is still close to a mile, so we grouped up once more and made the crossing en masse. On the way, the current was starting to do some interesting things just north of us, with a rip forming that was building standing breakers almost a foot high. I knew the area just off Cypress Head was renowned for its rips and whirlpools, but I was a little surprised to see such action this far out still. The rest of the crossing was made uneventfully, and we spent some time meandering through the Cone Islands. This was the first spot in the trip where we started to see seals, and there were several, some mothers with pups, playing in the waters off the islands and rocks. We gathered up again on the west side of the islands to start talking about where we were going to head for the evening. It was getting close to 6:00 by now, and it was time to set up camp and start dinner. After a bit of conversation we agreed that Pelican Beach was usually crowded, and if we paddled there first, and then had to head down to Cypress head, that would mean a lot more paddling, and not getting in to camp until almost dark. Instead, we turned south and headed for the sheltered bay on the north side of the tombolo connecting Cypress Island to Cypress Head. On the way down several hundred yards south of us, something large and very light colored leaped out of the water, crashing back in with a tremendous splash. Whatever this was did this three times, without us being able to get a good look at it any of the times. The only things I know for sure are that it was bigger than a seal, smaller than a whale, and very light colored - almost white. I think it was about the size of a sea lion, but I wasn't aware of them ever leaping clear of the water and splashing back down. If anyone has any clue as to what we were seeing, I'd love to hear about it! 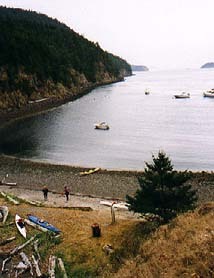 We landed on the north beach of the tombolo, and quickly headed up onto the head to look for campsites. The area was hardly being used, and in short course we found several that would do nicely. We then had to tour everyone through all the candidates, and we finally settled on a centrally located site, not too far from the beach, but with fine views back down to the northern bay. After hauling all the gear up onto the Head, and moving the kayaks well above any possible high tide line, we started a communal Dutch Oven dinner - barbecued pork with sesame seeds and hot mustard, baked chicken over rice with Italian seasonings and an apple cobbler for dessert were all served up with a flourish, and washed down with the finest of boxed wines! We built a small fire in the fire grate area, just for atmosphere, and sat around and visited and admired the stars until well after sunset. We headed for bed knowing that we only had a few miles to paddle the next day, a current that would be at our backs, and plenty of time to meander. During the night I was awoken a couple of times by the call of an owl, at near dawn it sounded like the owl got in a shouting match with a blue heron - the noise was quite impressive, and impossible to sleep through! The next morning, while we were eating breakfast, we wandered over to the east edge of the island and looked at the tide rips that were forming off the Head. 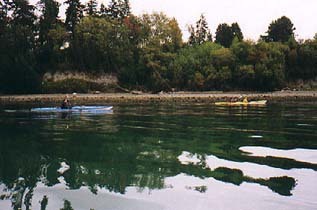 This area has been nicknamed "Hell's Half Acre", and has been the site of several sea kayak capsizings. We wanted to see what we were getting into before hitting the water, and although the water was churning close to shore, it was relatively calm out towards the middle of the channel. We decided we could head out of the northern bay, then head a little north in Bellingham Channel before turning east and ferrying across, back to Guemes Island. While we were making this decision, a beautiful wooden row boat, maybe 18 or 20 feet long, started working its was up the edge of Cypress Head. There was a middle aged gentleman and a white haired lady (his mother?) in the boat along with their dog. The gentleman was picking a very smart course, staying almost on the shore line to work the eddylines as far north as he could. Eventually, though, he needed to try and cross the current line. He was moving along quite nicely - maybe 3 or 4 knots - when he tried to cross - it was like he hit a brick wall! His boat speed immediately dropped to zero, and he had to start rowing with all of his back to get the boat making any headway again. He struggled against the current for five minutes or so, never quite finding a path of low enough resistance to get through. He eventually gave up and let the boat drift back down south a few dozen yards, pulling into a back eddy to rest. A few minutes later he was ready to try again - same strategy - hugging the shore as long as possible - then blasting out into the current. This time he chose a different line, and was actually making his way across the current line. He said something to the older lady - I think he was asking her to grab a second set of oars and help through the current. She managed to grab one oar, and then promptly lost it overboard! He looked skyward, and the look of disgust on his face was very obvious - this is why I think the woman must have been his mother - anyone else and he would have been complaining vociferously! The paddle floated on down current and got stuck in a small whirlpool. The rower let his boat drift down as well, and when they caught up with the oar, the elderly lady managed to lean out of the boat and retrieve it. Once more they started heading north. Once more they hugged the shoreline to take advantage of as many back eddies as they could. Once more the boat broke into the current line, but this time I think frustration gave our rower the little added strength he needed to push the boat just around the point and break back into the eddies at the mouth of the north bay. All in all, an impressive display of skill and strength, and an entertaining diversion for those of us on shore! Eventually we got breakfast finished and the kayaks packed up. By the time we hit the water, even the tide rips we'd watch the rowboat work had started settling down, but we still steered well clear of Cypress Head. We ferried easily across the channel, and cruised down the west shore of Guemes Island, letting the current carry us the direction we wanted to go. Turning the corner to paddle along the south shore of Guemes we could see the Anacortes-Guemes ferry making its crossing. We decided to continue down the south shore of Guemes, then make our crossing at the ferry run, where the distance between the two shores would be shortest. Maren and I paddled through the dolphins that make up the ferry landing on the Guemes Island side, and were surprised by the strength of the current, and at how quickly it was spinning around amongst the piers. Going into them, we were paddling hard on the left to keep from banging into a pier on our left side, but as soon as we cleared that piling, the current started carrying us strongly right into the next pier. 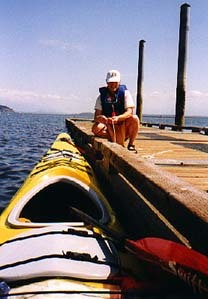 We quickly changed our stroke to drive the kayak back to the left, and after clearing the last piling motioned to the less experienced folks to go outside of the pier area. We caught up with two other paddlers here who had been out for several days, spending the nights on Lummi and Clarke Islands. They asked if they could make the crossing with us, so we all turned south as one flotilla, and headed for the industrial shore of Anacortes, where there were several large freighters moored. The currents were still playing with us, and for the first half of the crossing the water was carrying us west, right back into the path of the Guemes ferry! Not everyone was making good time here, so we stayed together, encouraging the slower paddlers to point up into the current, watch for the ferry, and paddle harder! By the time we were three quarters of the way across, the ferry left the Anacortes side and headed back for the Guemes Island dock. I'm certain the ferry captain had seen us, because the course he took swung well west of a straight line across the channel, giving us plenty of room to finish our crossing without worrying about crossing his course. Once we were a few hundred yards off of the Anacortes side of the channel, the currents changed back to where we were expecting them, and we got a nice free ride along the large ships, and around the corner back into the Cap Sante marina. We hadn't stopped for lunch that day, so after unpacking the kayaks, rinsing them off at the Eddyline wash station (another nice reason to launch from here! ), and stowing everything in and on the cars, we headed back for another meal of 'gator gumbo, smoked chicken, and some of the best barbecued beans I've ever had!